Deià is a tiny, picturesque town located on the Serra de Tramuntana coast of the Spanish island Mallorca. The village has a vast colour palate, the most striking of which is derived from the green-shuttered, tawny-coloured houses, many of which have been snapped up by millionaires and Hollywood stars in recent years for the secrecy and seclusion they, and the surrounding area, provide. While many areas of Mallorca have become extremely overdeveloped during recent years, this small corner of the island has remained mercifully untouched. The peaceful town is situated just 10 miles north of Valldemossa, and has become well known for being home to many literary and musical residents over the years. One of the most renowned such inhabitants was the English poet and novelist Robert Graves, who was one of the first foreigners to make the idyllic village his home. He moved to Deià with his mistress, Laura Riding, in 1932, before returning in 1947 with his second wife after the war had finished. His love of the island as a whole and the town in particular was well known, and he lived there until his death at the age of 90. Several of his novels were based on the island, including the historical novel Hercules My Shipmate. His former home has since been converted into a museum. Though the village has hosted its fair share of literary greats, over the years this demographic has shifted, with more and more millionaires and business tycoons claiming the resort as their own: not content with just owning Necker Island in the Virgin Islands, the business magnate Richard Branson has also snapped up the Belmond La Residencia Hotel in Deià – or La Res, as it is more commonly known by those that stay there – and transformed it into a luxury hotel, catering to the tastes of the rich and famous; something that Branson is no doubt well-versed in. Deià has always been a hit with those looking to escape from their hectic lives – indeed, the town, and La Res specifically, was where Princess Diana chose to hide away from the paparazzi when her marriage with Prince Charles ended. For those that are lucky enough to visit the town, it is evident why: walking along Deià’s labyrinthine pathways and alleys, protected by beautiful evergreens on either side, the surrounding environment seems to offer protection from prying eyes, giving travellers the chance to lose themselves within its walls. This sense of protection from the outside world means that more and more people are now venturing to Deià in order to relax and unwind. Days can be spent simply gazing upon the crystal clear water of the Mediterranean Sea with a glass of wine in hand, or meandering through the town’s narrow streets to sample some of its most delectable local cuisine. However, for those looking to ditch the balconies and glorious sunsets for a little while, there is also a scattering of tennis courts around the village, some run by the local council and others available to hire from various hotels. There is also a wide selection of other activities to choose from, including horse riding and a variety of watersports. 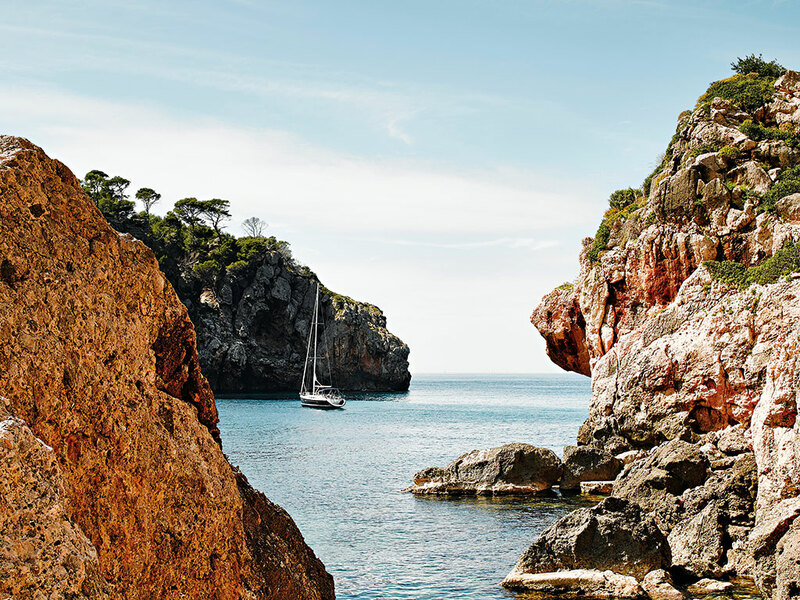 No visit to Deià would be complete without a visit to its beach, which is located in the most attractive of coves and sheltered by high cliffs. One of only a few beaches on Mallorca’s northern coast, Cala Deià is an intimate shingle beach that stretches for more than 70 metres. However, visitors should be prepared to see local artists with a penchant for skinny-dipping, as they attempt to keep Graves’ tradition alive.